Petronet LNG Ltd. sees a lifeline arriving for its loss-making Kochi liquefied natural gas import terminal by 2019 after it boosts capacity use fourfold. The only LNG terminal in southern India is operating at about 10 percent of its 5 million-ton-a-year capacity, according to Finance Director R.K. Garg. Capacity use may increase to 2 million tons annually after a 1,100-kilometer (683 mile) gas pipeline, being built by state-run utility GAIL India Ltd. and connecting consumers such as Mangalore Refinery & Petrochemicals Ltd. is completed by the end of 2018, he said. “After the pipeline is completed, definitely there will be more demand,” Garg said in New Delhi last week. “It will ensure that there’s not much pain on the Kochi terminal side, if not too much gain.” The terminal has been mostly idle since its 2013 start as GAIL could not complete its Kochi-Mangalore pipeline because of resistance from land owners. GAIL restarted work after Prime Minister Narendra Modi’s government, which aims to build 15,000 kilometers (9,322 miles) of gas pipelines, prodded provincial governments to resolve the disputes. 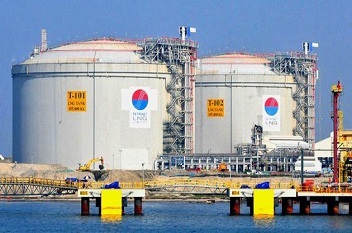 The stranded plant has been a drag on Petronet profits, which invested 45 billion rupees ($700 million) in building it. Petronet, India’s biggest importer of the super-chilled fuel, incurred a pretax loss of 2 billion rupees on the terminal in the year ended March 2017, company officials said in a May 10 conference call. A fourfold jump in demand will help turn the project profitable, according to Dhaval Joshi, an analyst with Emkay Global Financial Services. The LNG terminal currently has only two local customers -- Bharat Petroleum Corp.’s Kochi refinery and Fertilisers and Chemicals Travancore Ltd. -- restricting imports to one shipment every two months. The company has also been offering tolling services for traders to cope with the lack of business. “The low utilization forced us to rent out the terminal as a storage and reload facility,” Garg said.